Its been quite a while now since my food blog saw some new chow. I was on holiday in Mangalore for a week and was just too darn lazy to blog. But that does not mean that the blog misses out on any food special I indulged in. To begin with the first of many blog posts – It’s the Ramzan season and one of the greatest things about this time is the food available at Iftar – the break of fast. For years now Sudhakar and I have awaited Ramzan in Bangalore just so we could dig into some heavenly Haleem, a Ramzan specialty of Dakhani Degh, right next to Sagar Apollo Hospital. This small restaurant religiously puts up the same nondescript banner each and every year announcing this specialty. Its available right from the afternoon in small containers (Rs 75) and big containers (Rs100). Haleem is mutton that is pounded, mixed with a load of dry fruits and spices and cooked on dum overnight in a lot of ghee and oil. You can forget about healthy eating with this indulgence. When you get to Dakhani Degh, the haleem counter is set up right outside and you will see them ladling the heavenly goodness out of a huge vessel that is constantly cooking on a wood fire. A large container can safely feed four adults with a healthy appetite. Choose naans or rotis to go with this and always squeeze a bit of lime over the haleem before you start. The caramelized onion slivers on top only add to the smoky flavor. A perfect way to round of this meal is to have the Qubani ka Meetha, which is apricots stewed in sugar with dollop of fresh cream. Of course, once through with this meal you should not indulge in any work that is physically or mentally taxing – and by this I mean, the maximum you can do is drag yourself to bed and fall asleep. This year round, we heard of another place that makes haleem and Qubani ka Meetha and decided to buy from both places at once to judge on how good it was. This place is a home-run affair. Right opposite Dakhani Degh is a bumpy road. Take it all the way to the dead end and look for a sign board that says Farah Foods. This is the same establishment that now provides haleem to bigwigs such a Spar. Anyways, we bought the same set of Haleem and Qubani ka meetha. Both of these were a bit cheaper than Dakhani Degh. The Haleem tasted as good as the one from Dakhani Degh. But the Qubani ka meetha was a disappointment. It was a bit watery and did not really pack the punch of the heavy sweet that it is supposed to be. Since Anoushka has not yet developed a taste for haleem we got her a mutton biryani which is cooked the Hyderabadi way. All in all – our haleem experimentations left us satiated for this year. Can’t wait for next year though. And while on iftar food, Sudhakar went on this amazing ‘Iftar raid’ as he and his friends called it. Look out for his post on this blog soon. Shivaji Nagar, MM road on Mosque road, City Market, Rahamat Nagar and JC Nagar are a few hot spots, where people swarm after 8 pm the whole month of Ramzan, fervently crowding the shops to get their share of the delicacies. Here is a list of the most delicious and authentic Ramzan food we recommend. Haleem is essentially a dish made of wheat bran and meat served with soup and garnished with coriander and fried onions. “Apart from wheat and meat there are a little more than one hundred herbs and spices that go into haleem,” says Syeed Irfanudin who was the first to start a haleem stall in Russell Market and has been in this business for 11 years now. He sells around 1000 to 1500 plates of haleem every day. 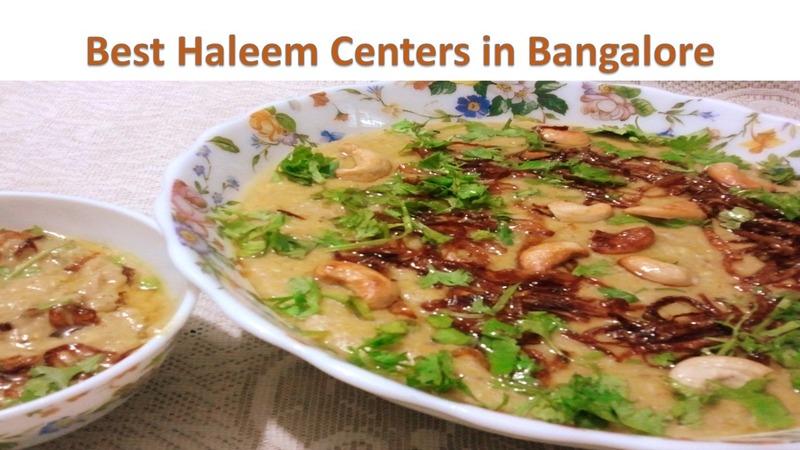 There are two kinds of haleem – Hyderabadi Haleem and Calcutta Haleem. Hyderabadi Haleem is the authentic haleem, just like it is served in Saudi Arabia, where as Calcutta Haleem is the Indian version of it. A whole plate of this tasty haleem starts at Rs 25 a plate and is quite filling. Harees is a dish that is similar to Haleem the only difference being, Harees is served without soup. Kheema samosas are a big hit during this season and sell like hot cakes. Head to the Russel Market for some of the most amazing samosas. You can pick up these samosas for only three rupees. You get vegetarian samosas also. We must tell you, it’s quite a steal in this city. Camel meat is a delicacy here and what better time than now to taste this meat. Camels are brought in from Rajasthan, especially for this season and can be savoured only in Shivaji Nagar. Try the camel meat sheek, chops and paya at the small food joints here. Wallet factor: Rs 40 to Rs 50 per plate. Badam Ka Hareera: This sweet drink made from milk, badam, khus-khus, coconut, ghee and garam masala, will help you digest all that you have sampled and also keep you warm in the windy Bangalore evenings. Wallet factor: Rs 7 per glass. Sweet Dahi is served in small matkas or earthen pots and are a must try. These are made of curd, khova, badam, milk and sugar and can be stored for two days. One matka costs all of Rs 20. Lassi, the all time refresher in both sweet and salt versions is sold at Rs 10 per glass. These are great coolers for the body and help in digestion. Qhubani ka Meetha is essentially a dessert made of apricots and badam and served with fresh cream. A world famous dessert, this one is not to be skipped. Wallet factor: Rs 15 for a cup. Gulkand and Maska is another sweet option, made of gulkand (rose petals) and butter, which is best had with bananas. These are just a few of the many options you shouldn’t miss out on this season. Some of these dishes are available only till September 21, the day of the big feast, which is the Id-ul-fitar. Game for a two-in-one deal, where you get to stay out late and eat those yummy meats? We bet your mouth is watering already. Fasting, during the holy month of Ramadan is considered as one of the pillars of Islam, and the same is preached to every Muslim, which is why, almost, 25% of the globe is fasting or observing “roza” during the season. The month is spent by Muslims fasting during the daylight hours, from dawn to sunset. But what makes it special for some, is the wide delicious spread of food that is laid out among fasting Muslim families “It’s important that, after a day long fasting, we get to eat what we want the most. I prepare a lot of delicacies at home, especially for the kids. They are the ones to relish the food the most,” said Amira, a home maker. But, hang on. Bangalore, has a huge population of students too, who have made the city their next home. Needless to say, there is also a huge section of them who are Muslims. So, what about them? Where do they get all these delicacies? Ramadan is the 9th month of the Islamic calendar where Muslims across the globe will refrain from eating, drinking, smoking, or indulging in any acts that are considered immoral or un-holy. Muslims are meant to fast as it teaches them to be patient, modest and spiritual while sacrificing their primal and worldy acts. Also Muslims are urged to pray and seek forgiveness for their sins. The significance of Ramadan lies in the fact that Muslims believe, and it is said in the Holy Quran, that the Quran was revealed to Prophet Mohammed on “Lai-La tul-Qadr”, or the night of power. This night is believed to fall on one of the last few days of Ramadan that are seen as the most important “rozas” or fasts. Alibaba Café and Restaurant is a popular place for Muslims to go and break their fast, and they have a delectable spread of “haleem”, “biryani” “kababs”, and other delights that are traditionally served during Ramadan.